As a member of the McHenry County Board since 2012, it has been my pleasure to serve the residents of District 3 and the entire county. On March 20, 2018, I am running in the Republican Primary for re-election to my seat. I would sincerely appreciate your support as I continue to work toward lowering your taxes and preserving the quality of life we enjoy here in McHenry County. This web site was created so that the residents of McHenry County can learn about my campaign and the work I am doing on behalf of the residents of County Board District 3 and the entire county. This site was built to be interactive. I encourage you to use the “Contact Joe” link to get in touch with me. 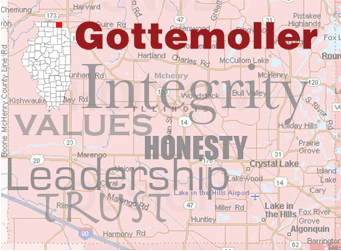 I have lived in McHenry County since 1984 and am a partner in the law firm of Madsen Sugden & Gottemoller in Crystal Lake. I have both lived and worked in District Three for 27 years. I consider myself very lucky to be able to spend so much of my time in Nunda Township, as I believe this part of McHenry County is a beautiful place to live, work, and raise a family. My family consists of my wife Chris, and our three grown sons. I have been involved with the local Republican Party for many years as a precinct committeeman and was recently elected as the Republican Chair of Nunda Township. Through all of my years of involvement, I have always supported a smaller and financially-sound government. I am a strong proponent for controlling taxes, encouraging job growth and protecting our environmental resources. When I took my seat on the board in 2012 I pledged to reduce the amount of money residents pay for county services. Each year since then I have voted to freeze the tax levy for the county, and this fall I will be leading the effort to reduce the amount of taxes McHenry County collects by more than 10%, which translates to more than $8 million that will remain in the pockets of county taxpayers. I would encourage you to visit this site often to learn about my plans for lower taxes, job growth and environmental protection. I look forward to sharing my vision for the future of McHenry County, and would appreciate your vote on March 20, 2018. Copyright © 2014 Joe Gottemoller, District 3. All Rights Reserved.